Writer's block is no fun. It used to be that if you just forced yourself to sit there in front of your typewriter long enough, something would eventually come out. But today, most modern computers are so full of bells and whistles, doodads and buttons, that you can sit there indefinitely "preparing to work" while endlessly fussing with the page formatting and trying to decide which font works better with your margins. Your formatting stays with the document, so you may repeat the process with every document. 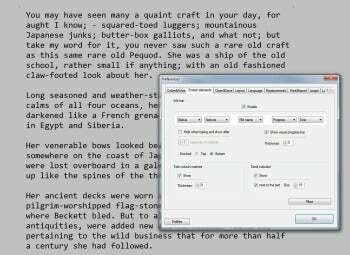 With free/donationware WriteMonkey, you set the look-and-feel of your writing environment just once (or not at all), and then just focus on your text. Version 2.3.5 adds a useful new Jumps feature. WriteMonkey's sparse, full-screen interface lets you focus on what you're trying to say, but is also very customizable. While WriteMonkey is not the first full-screen text editor to emerge in recent years, it is one of the best executed ones I have seen so far. Yes, you can configure a display font, background colors, and margins. But once you're done tweaking it, you are left with nothing but your text. I usually go for a monospace font (I use Microsoft Consolas, bundled with Windows 7), along with a cream-colored background and dark text. Along the bottom of the screen, WriteMonkey displays a customizable information bar. You get to choose what information it should show, and in what way. For me, the middle of the bar shows the filename, while on the right I can see the current word count, my progress towards my goal (measured as a percentage of the full word count I've set as a target), and the current time. The current time is important, because WriteMonkey obscures every other window and bar on the screen. Immediately under WriteMonkey's info bar you can also display a "progress bar." This is a very thin band of pixels (5 pixels in my case) which gradually fills as you approach your desired word count for the current piece. Once you exceed your word count, the bar starts filling again, this time in red (so you know by how much you've exceeded your target). WriteMonkey tries to replicate the typewriter experience in several fun ways. It has a feature called "Typewriter scrolling," in which the last line of text appears in the middle of the screen, and whenever you start a new line, the screen simply scrolls up. Another feature called "caret centering" lets you take this metaphor to the extreme, by making the caret stay in one fixed position, and scrolling all text on the screen left as you type (and back to the right once you start a new line). And if that weren't enough to make you feel like you're working on a typewriter, you can even switch on typing sounds that sound very much like an old electric typewriter (complete with a "ding" for every time you hit Enter). For serious writing, I don't actually use any of these features. For me, WriteMonkey is all about eliminating distractions and focusing on my text. Having to constantly save your file is another distraction, so WriteMonkey handles that for you. Auto-save is not a new concept, but WriteMonkey can save your file every ten seconds, or even more often. It can also save multiple backup copies of your text. If you are working on a long-form project such as a book or a research paper, Writemonkey's new Jumps tool can come in handy. It puts a project management interface right into the editor, letting you manage a directory full of related text files. You can set tags for each file, mark them with colored stars, fill in deadlines, and specify completion percentages which you can see as progress bars in the Jumps view. This is all done by writing a simple text comment as the first line in the file—no lengthy dialogs to fill in, keeping true to the spirit of simplicity. The Jumps view also lets you instantly filter files by name or tag, and create new files. It has its own set of shortcut keys and takes some getting used to, but it is a powerful way to keep tabs on a longer writing project. These days, much of our writing goes directly to the Web. WriteMonkey supports both Markdown and Textile, two writing systems that can translate into simple HTML. For example, if you surround a word with *asterisks*, WriteMonkey can convert that into proper HTML tags for you. This is optional--you can export your file into HTML, or even just copy it as HTML, ready to paste into a content management system. WriteMonkey is extremely lightweight, and feels very fast. While the editor is meant to run in full-screen mode, hitting Escape makes it switch to windowed mode, where you can use it alongside your other applications. Clear the screen of distracting menus while writing with this freebie.